TravelsinTaste.com recently had the pleasurable opportunity to chat with Executive Chef Michael Bloise about his restaurant, Wish, and the whimsical creations that come out of its kitchen. We had so much fun chatting with him, in fact, that we had not just one conversation, but two. First, we discussed Chef Bloise's cuisine, including his favorite flavors and techniques. Then, in our second conversation, we tackled his passions, his restaurant and the experience that he wants all his customers to have. For our second conversation, please read below. In the course of our conversation with Chef Bloise, we discovered that it's not just his food that makes him successful; it's his personality, including his immense drive and his intense passion. Both have helped him achieve great things in the kitchen, as well out, perhaps the greatest achievement being the enthusiasm that he stirs up in his customers. One client even visits Miami all the way from New York on her birthday every year to spend the evening at Wish, where Chef Bloise prepares her a special dessert every time! Of course, the food is a big driver in customers' enthusiasm at Wish. And it doesn't just taste amazing, either. It also looks amazing -- even on paper. That's because Chef Bloise, who is an avid photographer, does his own food shots. "I love photography," he says. "I've always loved pictures. You can stare at one for a while and see different things in pictures that are done really well." His extra talent has definitely served Chef Bloise well, as his beautiful creations at Wish are picture perfect! Wondering what inspires Chef Bloise -- to take good photos, make good food and more -- we asked him what has been the most significant moment his life so far. The answer, he told us, is what cemented his career path as a chef, which was already guiding him toward culinary excellence. "When my son was born," he says. "I was already cooking, already on my way when my son was born; at that moment, I knew that I had to be great for him. I'm still working on it." 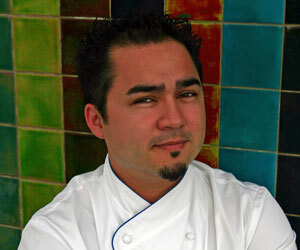 Indeed, Chef Bloise says that his son has been the greatest reason behind his culinary success. "I truly mean that," he continues. "Having him as a responsibility has made me stay diligent, stay determined. There were quite a few jobs I would have quit, but I had to stick it through. He's really helped make me settle down and try to make the best of myself.